Town & Country magazine asked us to decorate an entire house at the Ford Plantation near Savannah, Georgia, a series of new houses at Henry Ford’s historic winter retreat, for an editorial feature in the magazine. In conceiving the decoration, we conjured a fictional scenario to guide it. Here, the narrative became that of a young family: a mother, father, and two children, a boy and a girl. This family was attracted to plantation living with all its rural activities and charms of the country—especially the waterside, where the house is sited. 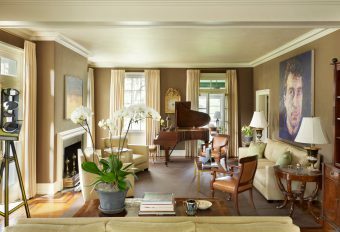 They would be traditionalist with a modern bent; for example, they preferred a living room that could be set for dining rather than two separate rooms. 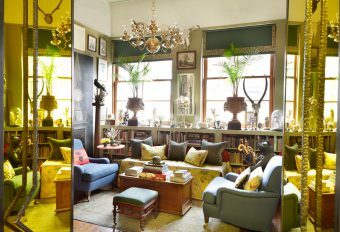 They were attracted to artistic things and collected antiques—but not at the price of personal discomfort. Jim Strickland, a noted authority on traditional houses in the South, designed this Low Country plantation-style home so that it extended parallel to the water with a large multipurpose room in the center, flanked on one side by a kitchen and a breezeway that connected to a studio and home office. On the other side was a library and another breezeway leading to the master suite and a large screened porch. Two children’s rooms and another master bedroom were located upstairs. 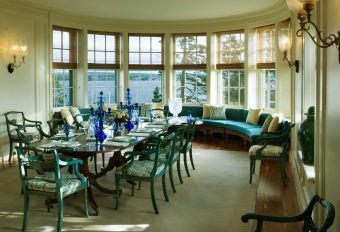 The center of the house is the large shared living and dining room space. 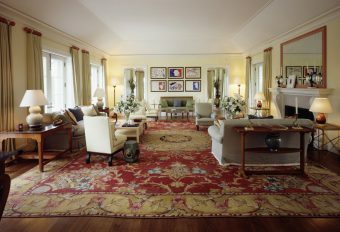 The living room space is furnished with comfortable seating covered in red and blue fabrics on a simple sisal carpet. 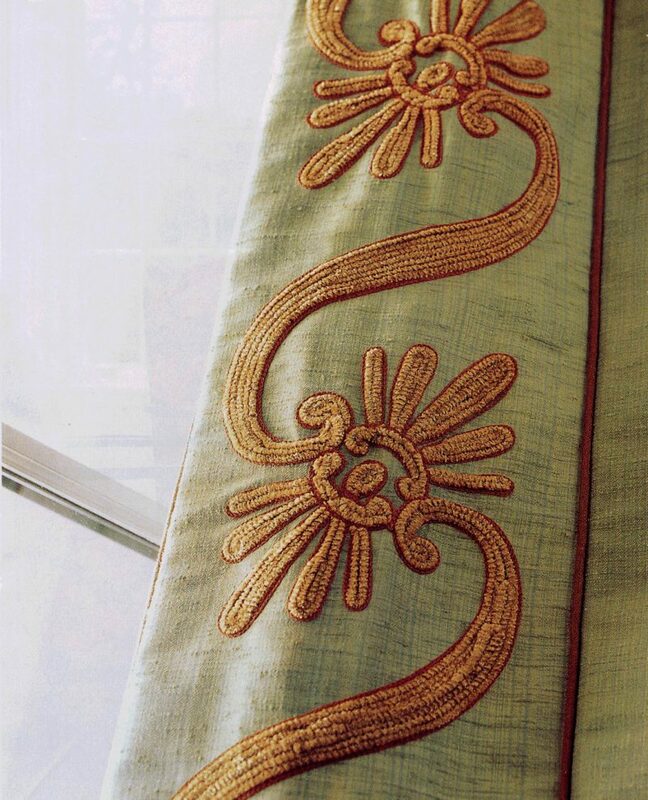 The green curtains are sumptuously embroidered with a scroll-and-flower motif that adds an element of luxury to an otherwise informal room. 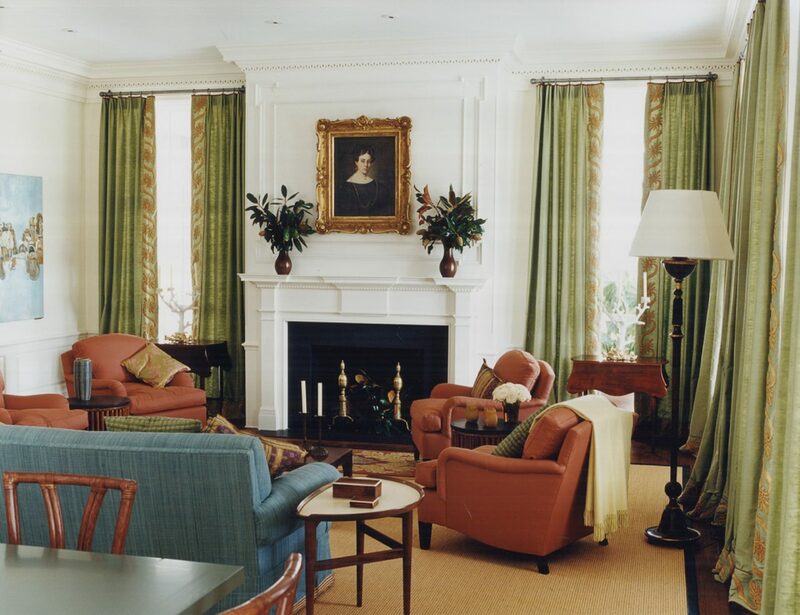 The living room curtains are hand-embroidered by the Penn & Fletcher workroom using chenille threads. The design is subtly edged in red to contrast with the green ground. In the dining area, an antique Boston sideboard is paired with a Prouvé-style table and rattan chairs. The Vesta Heads sculptures are the work of artist and designer Oriel Harwood. Their pronounced color created a debate when they were first installed, but today, with the popularity of coral, pinks, and reds in decorative arts, they seem almost understated. 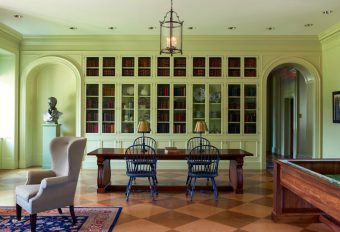 The library is painted to look like cypress, a wood that is often found in the historic architecture of this region. A portrait of James Oglethorpe, the founder of Georgia, hangs on the bookshelves. A pillow with an appliqué pattern of a magnolia and the table skirt with special embroidery were made for the room. 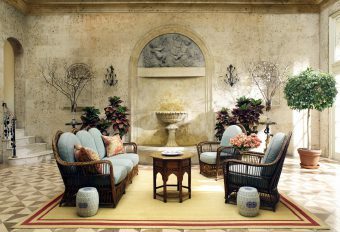 Our decoration largely played to the water—especially the rooms most closely associated with it. 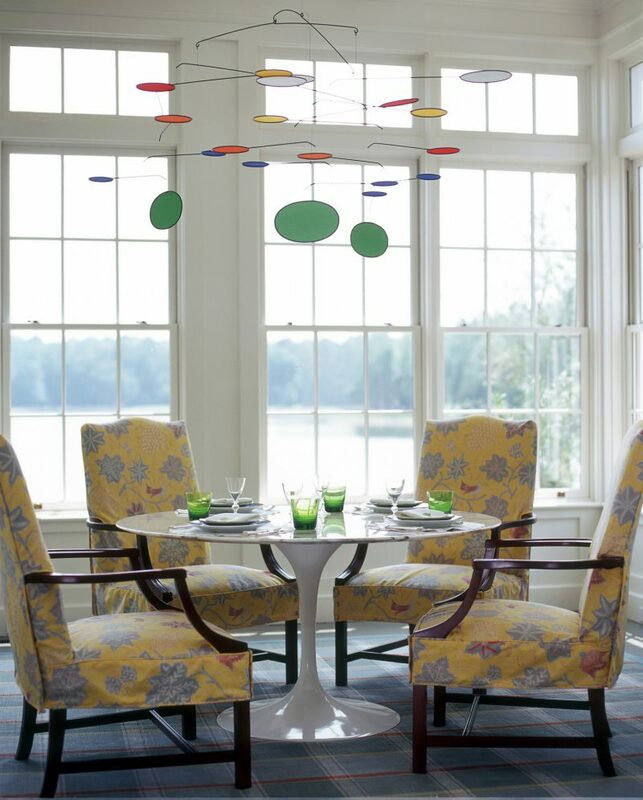 For the kitchen, we chose a round Saarinen breakfast table with antique lolling chairs around it and, for fun, we added a mobile from the Guggenheim Museum gift shop over it—but high enough so it does not block the view. 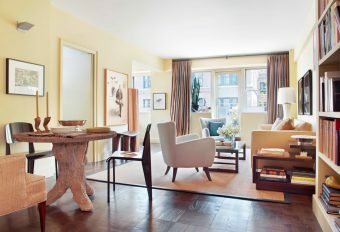 The studio is whimsically furnished with sculpture on stands, a chair designed by Keith Haring, and a hooked rug on painted floors. The idea of using kites rather than curtains to decorate the windows came from the library of an 18th-century mansion in England, a contemporary touch by its present-day owner. We took the design of the screened porches more seriously, using practical furniture including Windsor chairs, which have an early American history of being used inside and out (George Washington’s Mount Vernon still features them on the front porch). 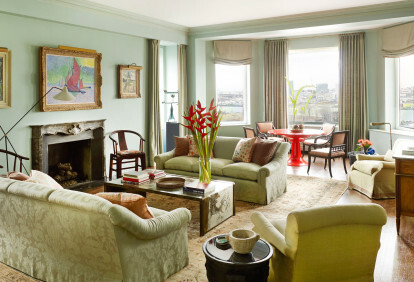 The green-painted ceiling is based on historic examples found on porches in South Carolina. The porch, with its lake view, can be used comfortably as a living room for most of the year in the Savannah climate. Hence its decoration with a set of comfortable “Gothic” rattan furniture, plenty of tables to set drinks, and lighting to extend its usefulness into the evening. 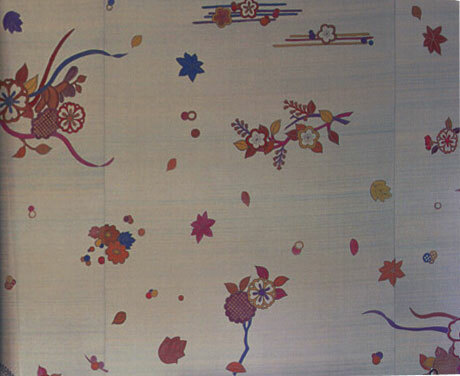 We covered the walls of the downstairs bedroom in silk beautifully painted by Lucretia Moroni in a water-like Japanese design. The bed, lent by friends at Florian Papp, is part of a special group of late-19th-century furniture made of light-colored woods turned to resemble bamboo, which has long been used in the tropics for making furniture. Plain linen curtains and the sisal matting relax the space. 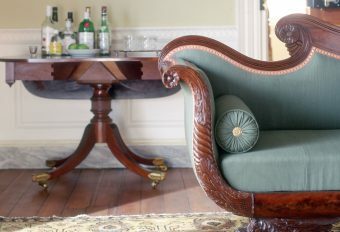 The Wrightsman-style chair in the downstairs bedroom is one of the most beautiful chair forms. 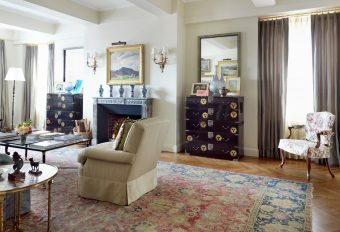 It is a tour de force of fine upholstery, executed with great skill by a storied workroom. 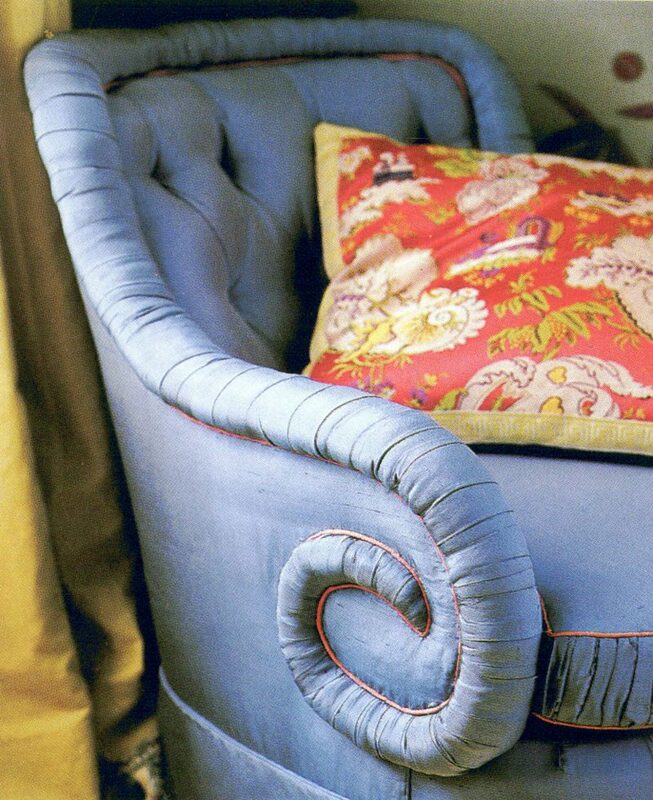 The chair’s back is tufted blue taffeta with a rolled border along the back and arms, ending in a scroll below the arm rest, with a touch of pink cord for contrast. The upstairs bedroom is dominated by our interpretation of the Southern bed, which often take advantage of the high-ceilinged rooms typical of the region and have elaborate curtains and ceilings. 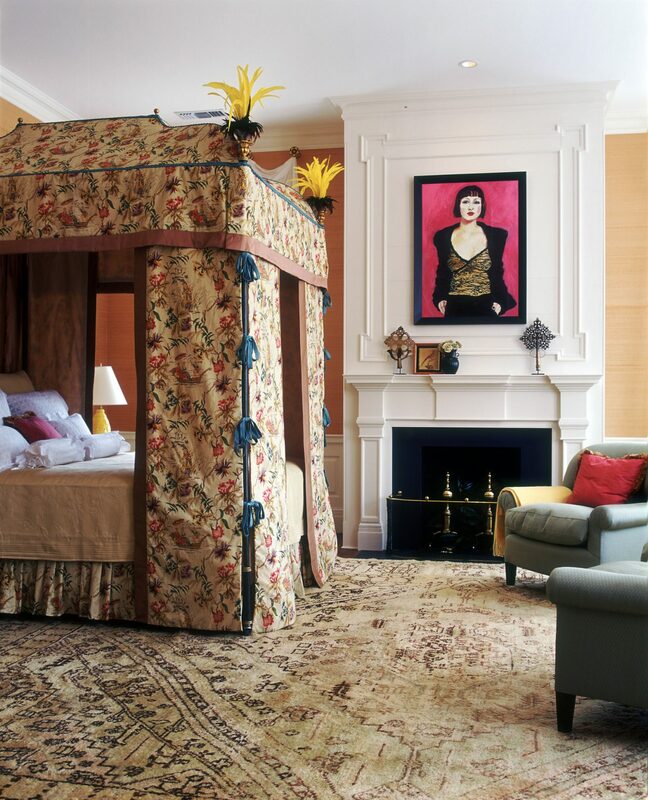 Our version, however, is hybridized with beds from the Italian Renaissance—the flat panels of drapery with the ribbons and the feather bouquets. This bed was the piece de resistance of the house. Joe Biunno, head of one of the best wood-working and gilding shops working today; turned the urns, Thomas Jayne’s husband, Rick Ellis, salvaged the feathers from old Mardi Gras costumes. 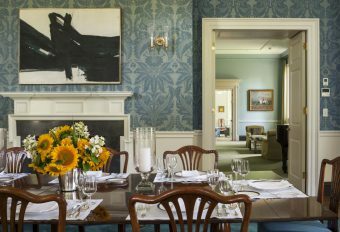 The portrait above the fireplace is by Alison Nash, an artist who worked at the Studio during the project’s creation. 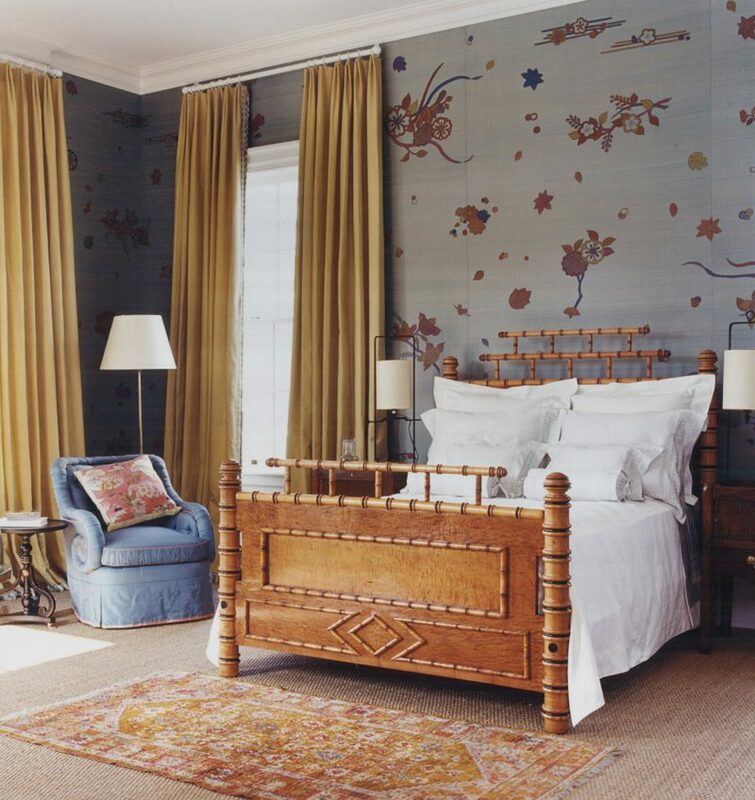 The master bedroom walls are hand-striéd to add nuance and texture. 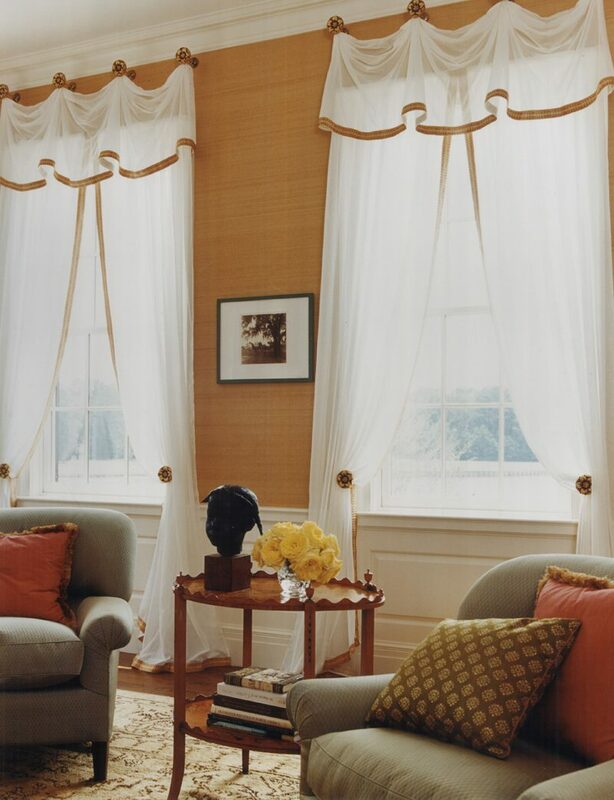 19th-century-style sheer curtains and valances hang from rosettes. 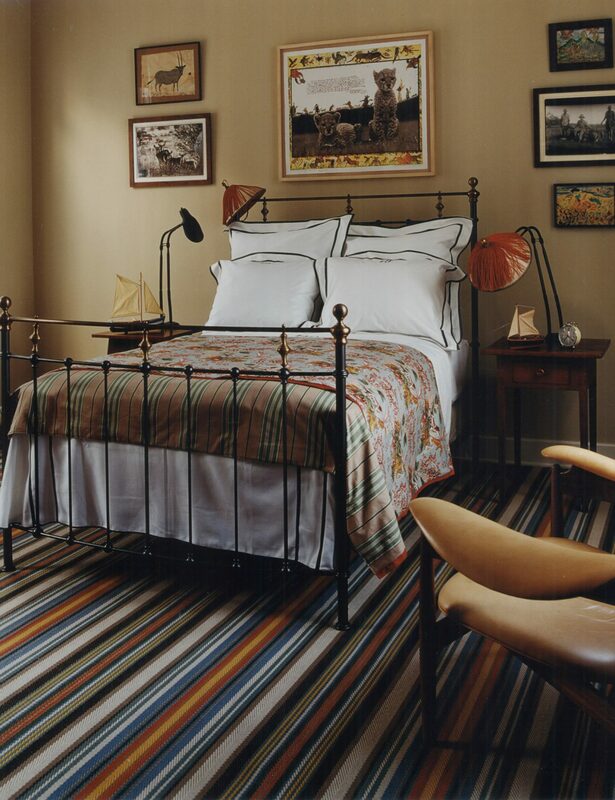 Another guest bedroom features a bold striped wall-to-wall carpet set parallel to the bed. A group of animal and safari prints above the bed stand out against the ocher walls. 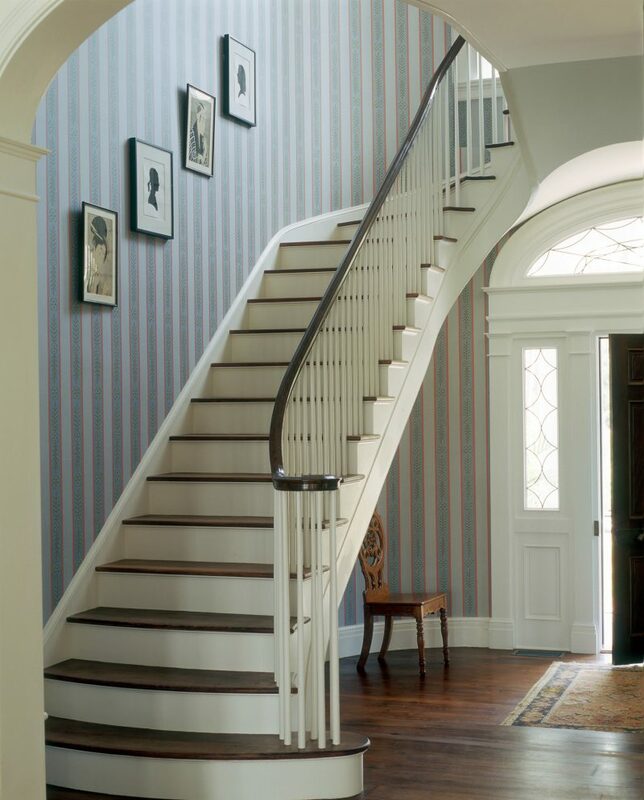 The entry hall’s striped wallpaper by Cole & Sons was the first thing chosen for the decoration and became the leitmotif for the entire house. 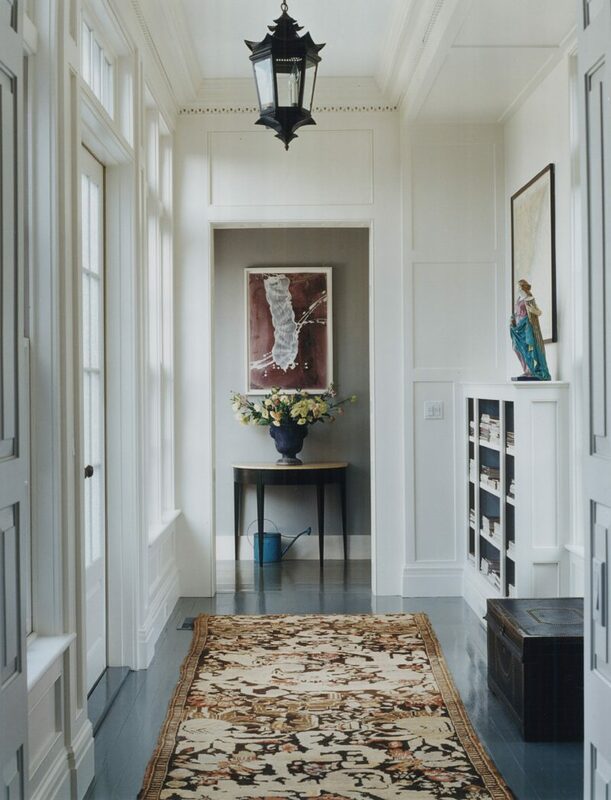 The hallway features painted floors, a chinoiserie lantern, and a demilune table paired with a watercolor strategically placed at the end of the corridor.